Newsletters have an open rate around 20%, and transactional emails have an open rate around 50%. This means that trigger-based transactional emails are over 100% more effective than newsletters. The fact is that emails sent based on customer actions get more opens, clicks, and conversions because they are contextual. 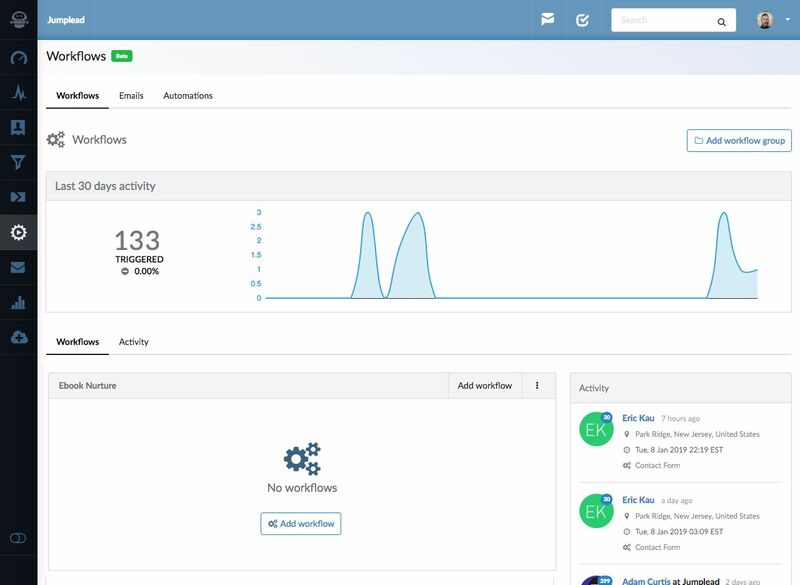 Much of the activity undertaken by marketing automation is the triggering and delivery of autoresponder sequences that are tailored to a sales stage or particular activity undertaken by your lead. This could be opening a previous email, completing a conversion form or landing page, even visiting a particular web page. 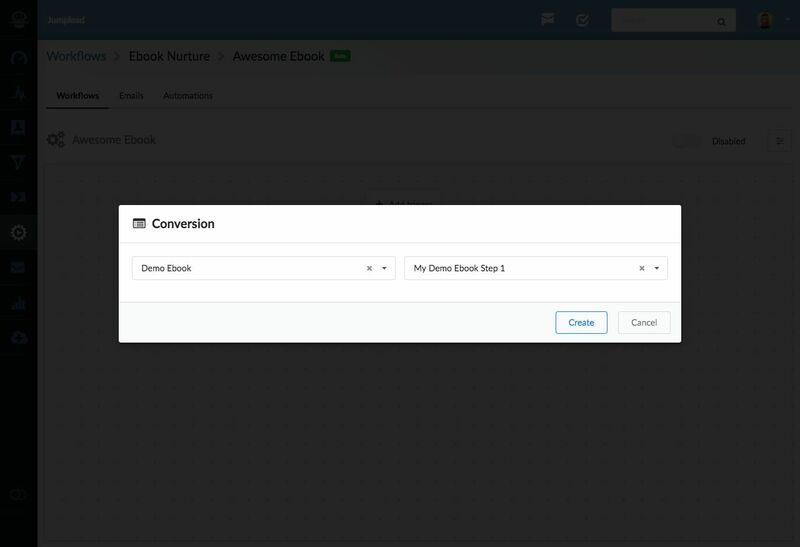 Sending a multi step email campaign in Jumplead is done by creating an Automation Workflow that is triggered by an event of activity such as completing a conversion form. 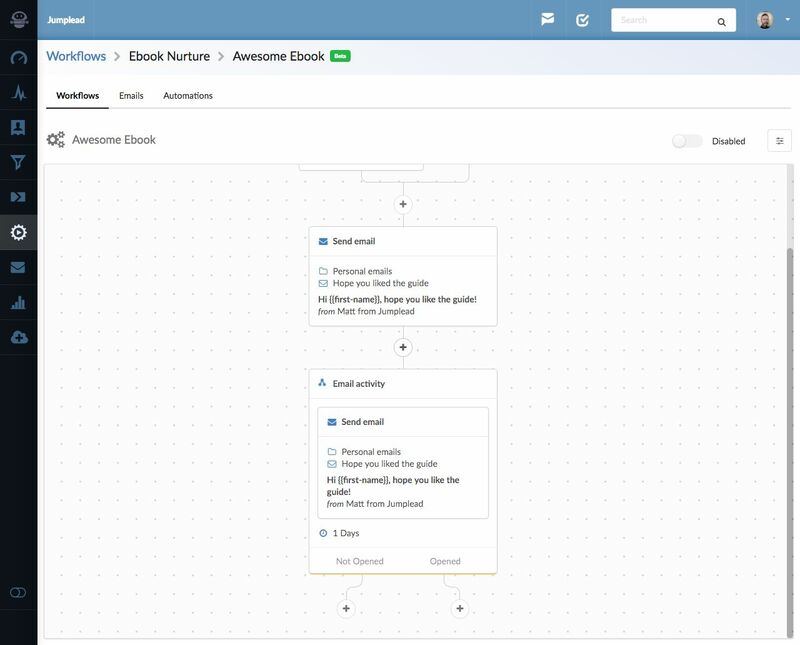 Workflows allow you to visually create powerful multi-step logic flow campaigns that can be triggered by the conditions you select. 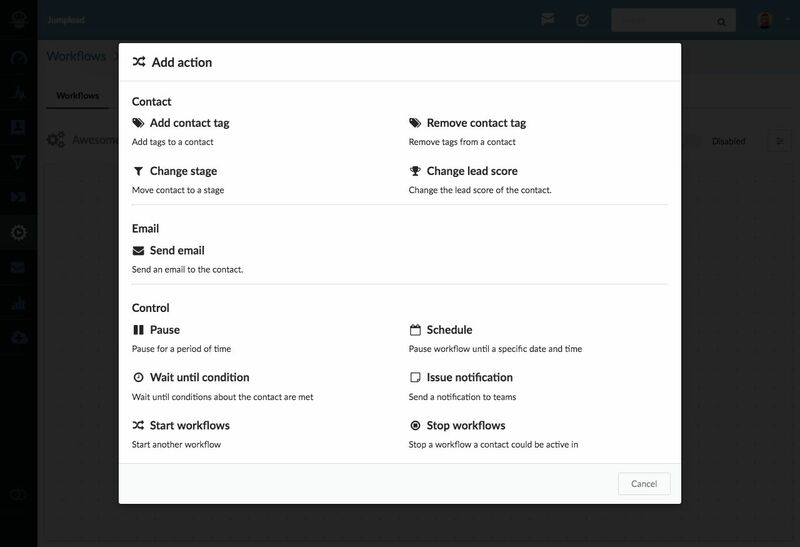 There are also flow control steps that allow you to take different routes depending upon how your contact interacts with your emails etc. 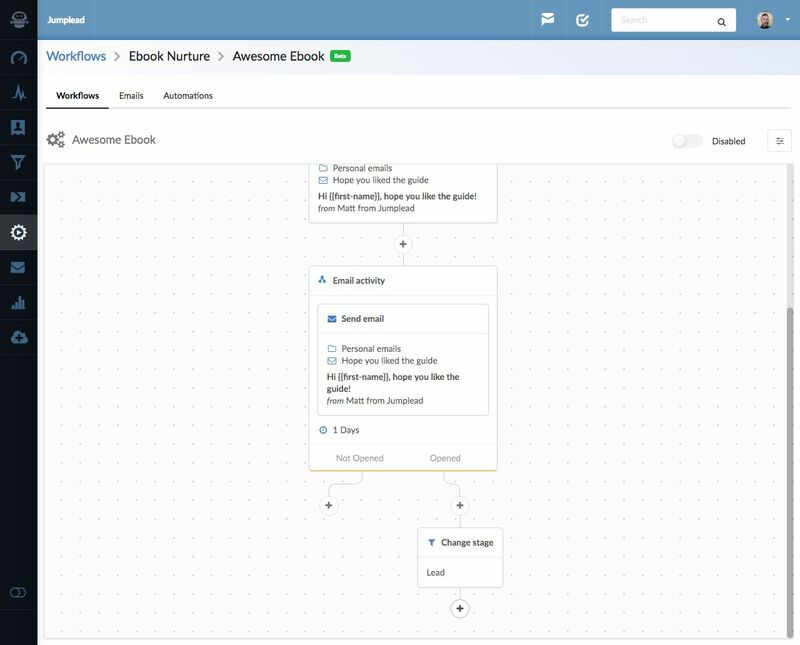 Workflows are organised into groups to keep related Workflows together and making them easier to find and manage. 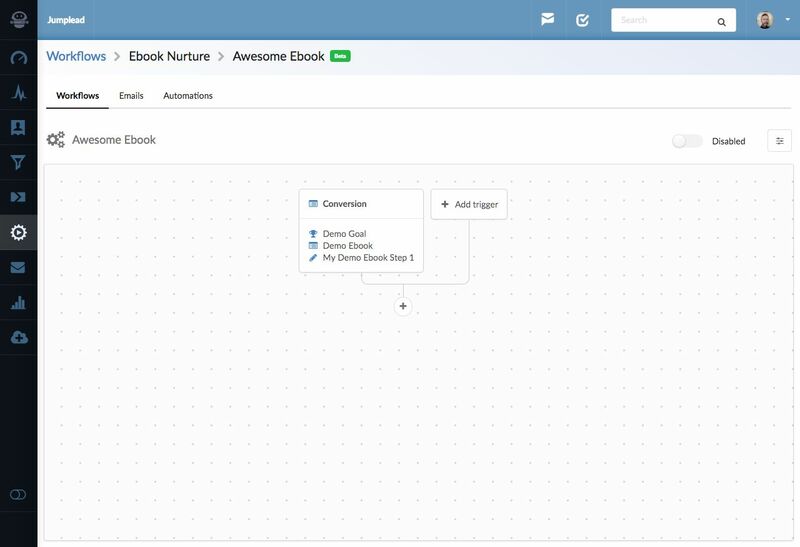 You can create a new Workflow group with the button at the top right hand side of the main Workflows page. 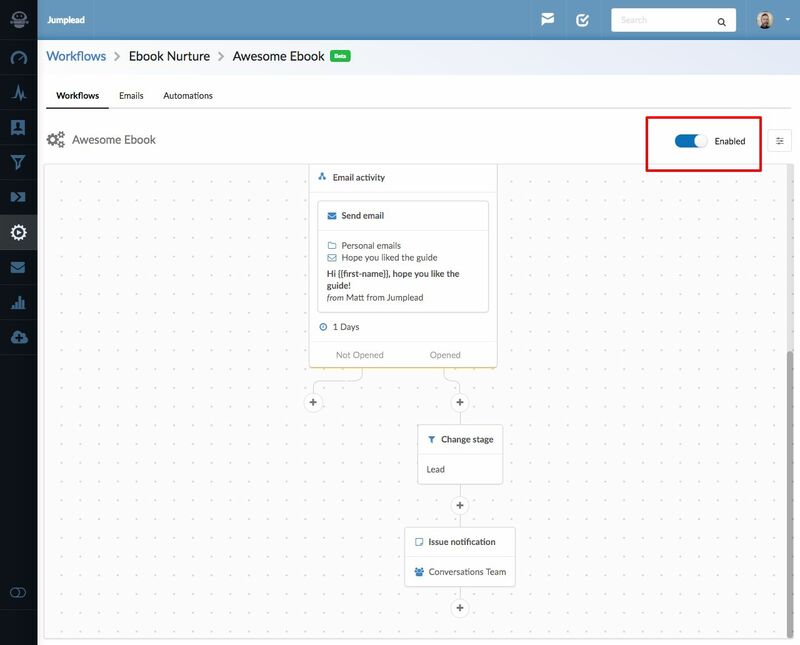 When creating a new Workflow group give it a name and description, it will then be listed on the main page and available for you to add Workflows to. 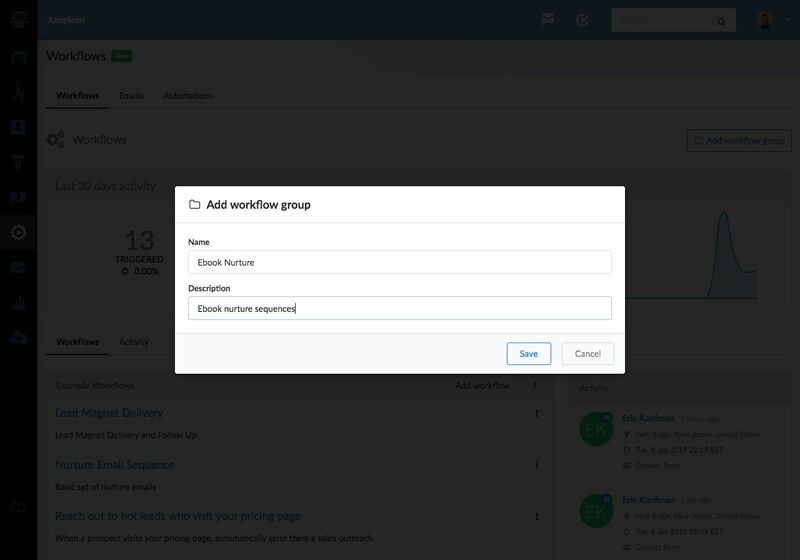 When adding a Workflow to a group, you can select the 'Add Workflow' button in the top bar of the Workflow group or if there isn't a Workflow in that group already click the 'Add Workflow' button in the empty group. 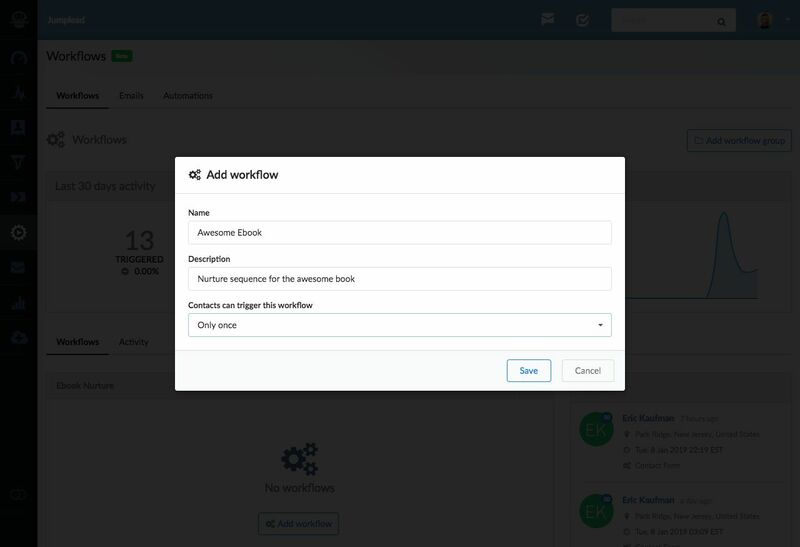 Give your new Workflow a meaningful name and select whether you want to allow individual contacts to trigger this Workflow once or multiple times. 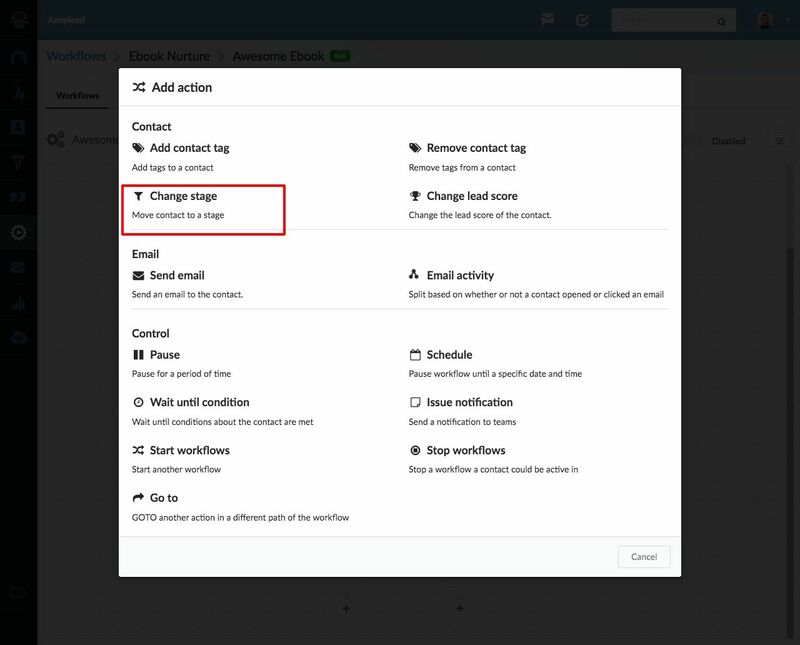 If the Workflow is triggered by something that might happen multiple times such as a page visit or an email open then it's best to select 'Only Once' to prevent duplicating email sends etc. 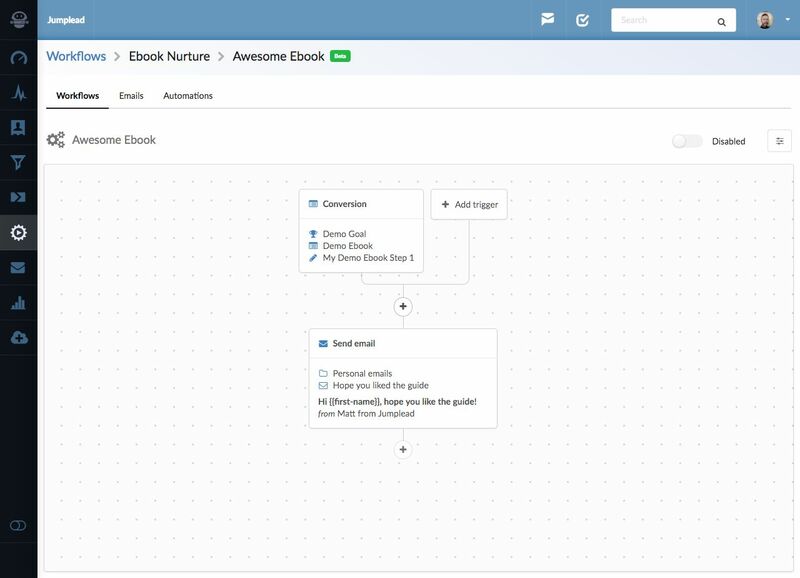 With your Workflow saved you will be taken to the visual Workflow builder. From here you can select the trigger you want to use to start your Workflow. After selecting your first trigger, you can then select other triggers if you wish your Workflow to be started in multiple ways. Conversion. Either a Conversion Flow form step or a Landing Page. Lead score changed. When a lead's score passes a certain threshold. Tag added. When a contact is tagged. Tag removed. When a tag is removed from a contact. When you select the trigger you want to use, you will be able to select the detail of that option, here I have chosen a conversion and selected the Landing page and step I want to use. (Both Landing pages and Conversion flows are capable of having multiple steps in Jumplead). 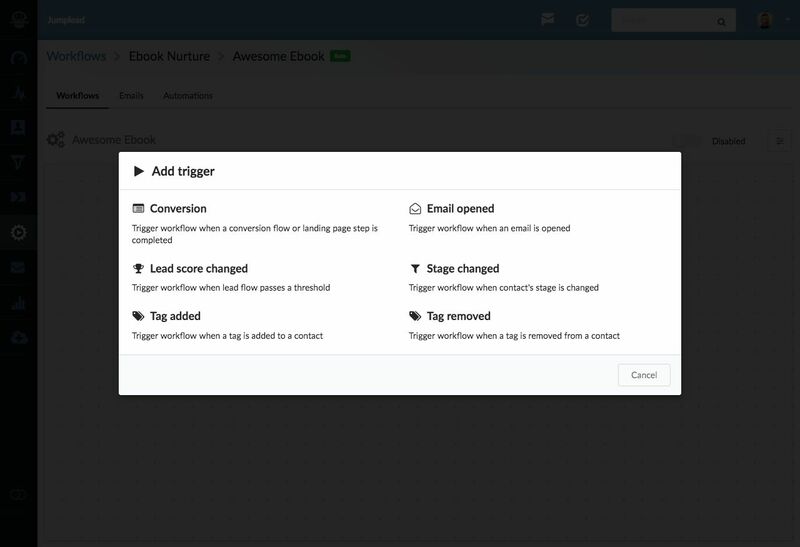 Having created my trigger we are taken back to the visual builder and we can see that there is the option to add another trigger alongside my first one. To add a new step to the sequence click the '+' icon which will then open a new dialogue box to add your required action. 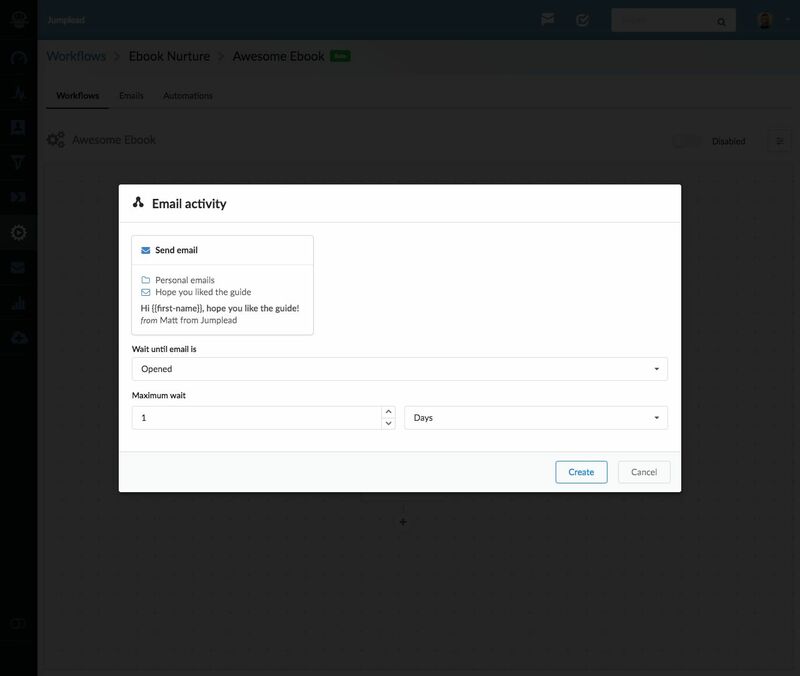 There is also the option to send an email, the emails available to Workflows are added in the 'Emails' tab in the Automations section. Pause. For a specific period of time. Schedule. Pause a Workflow until a specific date and time. Wait until condition. Wait until conditions about a contact are met. Issue notification. Send a notification email to a Jumplead team. 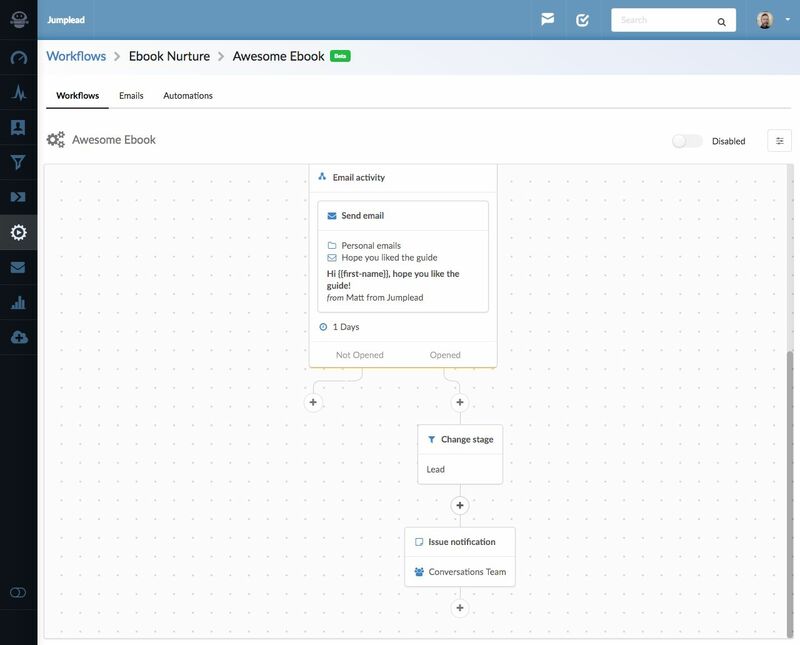 Start Workflows. Start another Workflow. Stop Workflows. Stop a Workflow that the contact could be active in. Note: You can manage which users are in which Jumplead team in the Account Settings pages. I have chosen to send an email and selected one that I had previously created in the 'Emails' page within the Emails section. 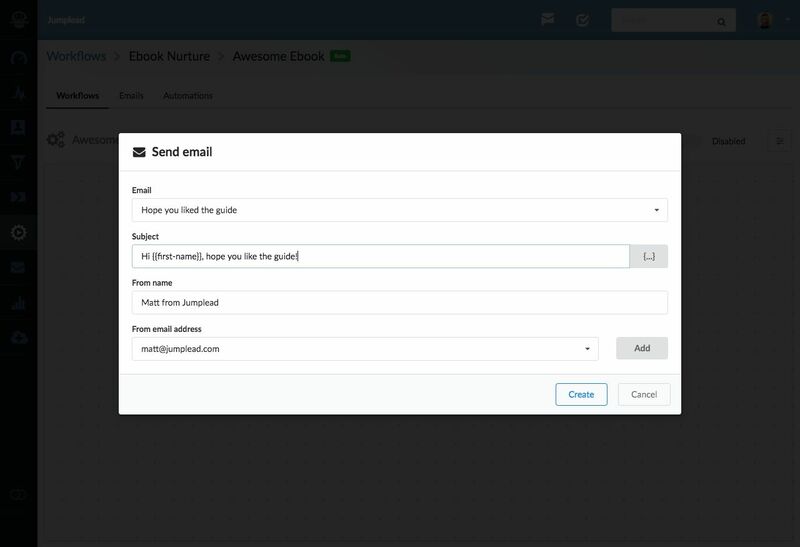 When setting up the email send, you can add a specific subject to the email when it is sent in this step, allowing you to resend the same email with alternate subject lines if the contact does not open the email the first time. You can also choose 'From name' and 'From email address' on a per step basis. 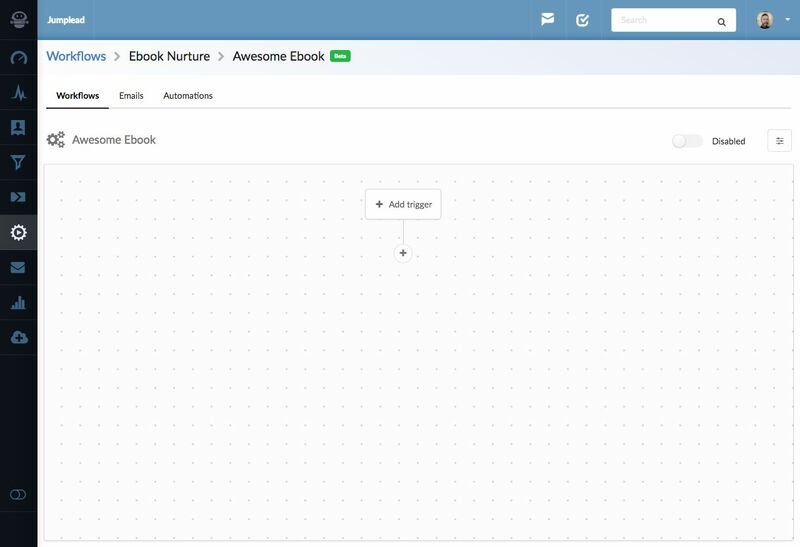 Once the email is saved you can see it is added to the flow in the visual builder. To add another step or to make a change based upon the email you have sent click the '+' icon. 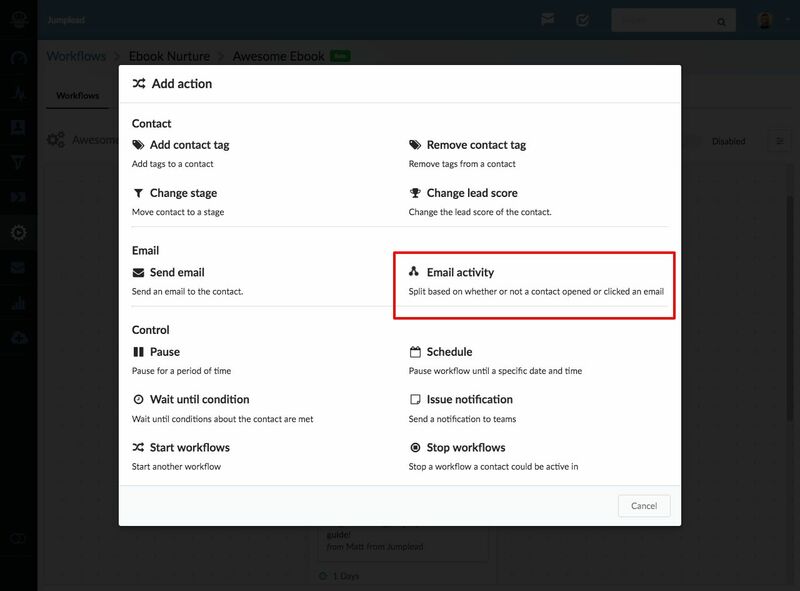 If the new step follows on from an email send, you will have the option of adding an 'Email Activity' action. 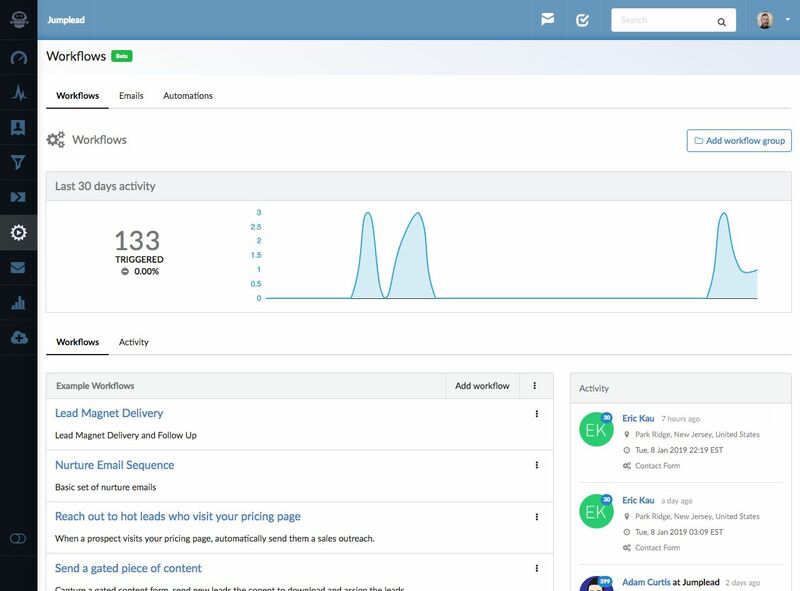 This will allow you to test whether the email was opened or clicked within a specific amount of time. With the conditional email step in place you can then choose which actions you want to use in either scenario. 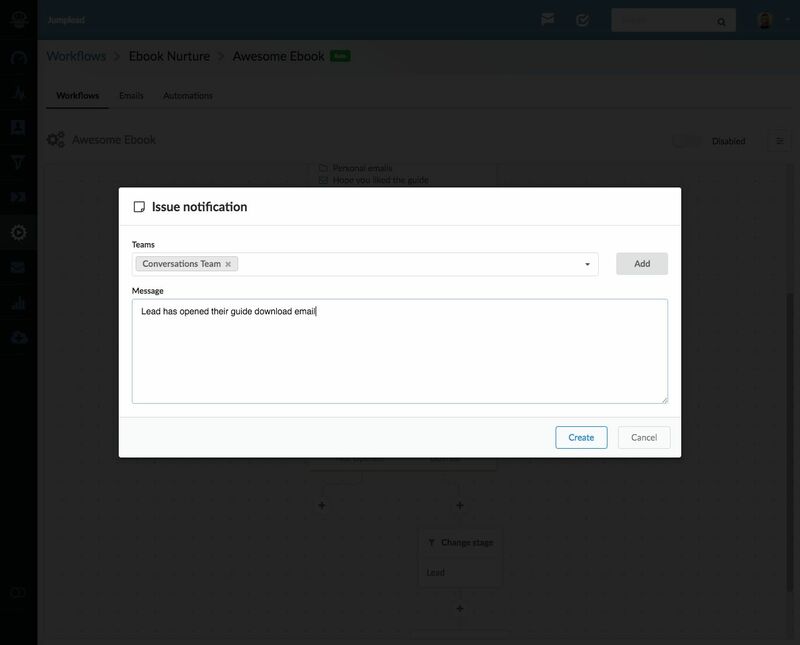 A common use of this technique is to try alternate subject etc for unopened emails, then when one is opened using a 'Goto' connector to move the contact into an alternate branch of the flow. 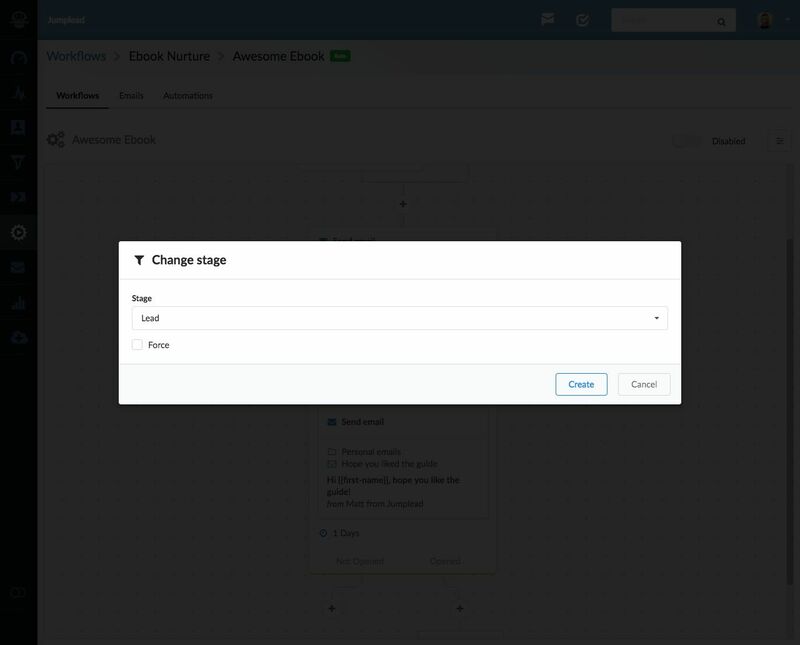 For my example Workflow I'm going to change someone's stage if they open the email, so on the 'Opened' connector I will add a 'Change Stage' action. Updating leads that open the email and moving them into the 'Leads' Stage. Here we can see the Change Stage action added to the Workflow. Now, just so that our sales team is keep in the loop, I'm going to add a notification to send anyone in the Team a notification email. Once saved, we can see that now added to the bottom of the Workflow. Those are the steps required to build up your Workflows. Once you are happy with your Workflow, you'll need to Enable it for it to start working.